Summary (from the inside flap): Eleven-year-old Melody has a photographic memory. Her head is like a video camera that is always recording. Always. And there's no delete button. She's the smartest kid in her whole school--but NO ONE knows it. Most people--her teachers and doctors included--don't think she's capable of learning, and up until recently her school days consisted of listening to the same preschool-level alphabet lessons again and again and again. If only she could speak up, if only she could tell people what she thinks and knows...but she can't, because Melody can't talk. She can't walk. She can't write. 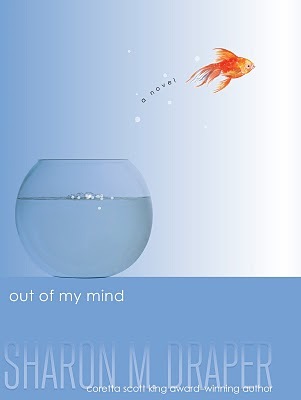 Being stuck inside her head is making Melody go out of her mind--that is, until she discovers something that will allow her to speak for the first time ever. At last Melody has a voice...but not everyone around her is ready to hear it. Review: This book is wonderful! I must admit I was emotional as I read this book, partly because there are some very emotional parts and partly because I had just watched the first 2 Chilean miners come up during the rescue. Sharon Draper has done a fabulous job of telling the story of someone whose story would not normally be told: a girl with cerebral palsy. I think most people would admit that they assume brain function matches physical function when it comes to people with cerebral palsy. We had a student, Gus, who graduated last year. He was confined to a wheelchair and had trouble talking. But there is something about Gus. Everyone on campus knew him, he was somewhat of a celebrity on our campus. I wish it could be that way for all students, but especially those who feel isolated by their physical or mental abilities. Draper shows what life is like for students in the "severley handicapped" classrooms in a school. How they repeat very low level lessons, are often kept separate from the rest of the school, and how they put up with teasing and invisibility from students and adults alike. This book is not only Melody's story, but that of her family, her neighbor who takes care of her after school, her classmates, and the teacher that believes in her. I really like that assistive technology plays a large role in this story. Melody uses a computer that speaks for her, giving her an opportunity to show what she knows. There isn't anything I didn't like about this book. It is touching, exhilarating, frustrating all at once as you go through a year in Melody's life. I highly recommend this book to adults and youth (middle school and up even though the main character is 11). I have seen this book before but didn't know what it was about. It sounds amazing! I have to read it! I think you would also like The View from Saturday by E. L. Konigsburg, where the teacher is the one in the wheelchair. Bonnie--Thanks for linking to your review. I"ll have to see The View from Saturday as well. I read this book based on your review, and here's mine!